From television, to war toys, to the latest Hollywood blockbuster, kids today soak up an enormous amount of violent imagery. Although most of it is pretend violence, research suggests it still may be profoundly shaping the minds and spirits of our young people. More than 3,000 studies point to a strong correlation between violent media consumption and aggressive behavior. People have been calling for limits to television violence since the 1950s, but on-screen brutality and bloodshed has only increased with time. According to a 2003 report, the average American kid will have witnessed 200,000 acts of violence, including 40,000 murders by the time he or she turns 18. Of course, it’s more than just television. 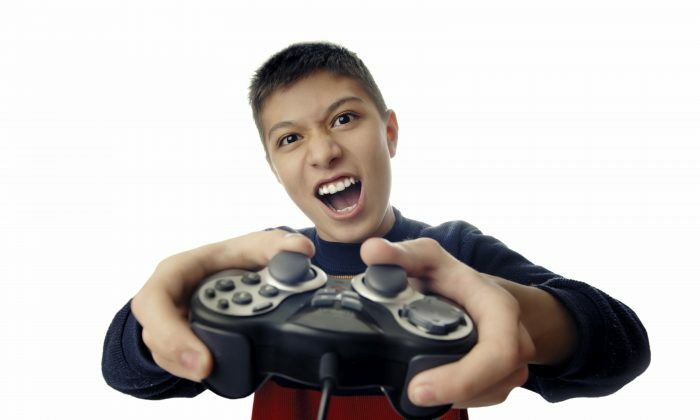 A study from the Henry J. Kaiser Family Foundation found that nine out of ten of the top-selling video games contained violence. About half of all games contained serious violence, and 18 percent contained violence as the primary focus of the game. According to Jan Arnow, author, and internationally renowned expert on the effects of violence and conflict resolution, we live in a culture where kids are in essence being trained to hate and fear. “If you look back at the television, movie, and video game line-up about 10 years ago it wasn’t as bad. But we as a culture grow desensitized so they have to ratchet it up in order to gain our attention back. It does go up every year,” she said. Arnow first became concerned with escalating media violence over 30 years ago when she was raising her own kids. She worried about what would happen if the trend continued. So she traveled the world interviewing young people who lived in regions of war and conflict—Palestine, Israel, the Soviet Union, and Northern Ireland—to see how the experience shaped their worldview. The common thread was that none of them could envision a future for themselves. “You say, ‘What do you want to be when you grow up,’ and they look at you like you have 12 heads. ‘Grow up? I’m not going to grow up. I’ll be dead.’ I got that a lot,” she said. Researchers have found that our cultural obsession with violence and conflict has reached a saturation point where American kids are developing a similarly hopeless outlook. In one recent study, more than 60 percent of children worried they might be killed, and 19 percent sometimes wished they were already dead. “This is exactly what we’re seeing now,” Arnow said. Some studies suggest that the more violent media kids are exposed to, the more they’re apt to think of violence as a socially acceptable way to deal with problems. Each day, about 2,000 kids are attacked at school, and almost 200,000 miss school because they fear an attack. Some schools are addressing the problem by getting tougher on bullying. But just like laws against shootings, hate crimes, and domestic abuse, Arnow says these efforts miss the root of the problem. Violent media has been gradually expanding in American culture for decades, so the effects here may be harder to catch. But in Cuba, where exposure is relatively new, the trend has been unmistakable. Arnow was surprised when she was asked to facilitate a conflict resolution program in Cuban schools, because she’d heard that they had no issue with school violence. But administrators told her that all changed with access to video games. In her new book , “In the Line of Fire: Raising Kids in a Violent World,” Arnow offers over 400 useful tips that she says can help protect children from damage. One key piece of advice is helping children develop media literacy. According to Arnow, young people who acquire these skills, even if they consume violent media, will be less apt to be influenced by it. Developing such skills requires some adult guidance and participation. Arnow urges parents to “find the moral in the madness” by watching the programs their kids watch, playing the video games their kids like to play, and then getting them to think critically about what they see. Arnow’s book is organized into factoid lists, relevant quotes, and other sidebars that will appeal to casual readers who just want to digest a little at a time. It also offers several web links, tips, and other resources for those who wish to dig deeper into a particular subject. Chapters cover a diverse range of topics such as hate crimes, the psychology and marketing of war toys, and cyberbullying. While the book is science based, many will oppose some of Arnow’s targets, such as America’s gun obsession. The “Guns Are Us” chapter devotes several pages to confronting prevalent beliefs such as the weapons ownership mantra of “guns don’t kill people, people kill people,” and the notion that armed guards in schools make children safer. “While no discernible link between safer schools and armed guards has been established, about one-third of our schools already have armed guards on the premises, and the demand for school policing has made it the fastest growing area of law enforcement,” states the book. “In the Line of Fire” is a book with an ambitious agenda, but its promotion of peace is something we can all learn from. The future it anticipates is one we can’t afford to ignore. The United States manufactures more firearms than any other nation, yet demand here is so high that on top of the over 6.5 million domestically manufactured guns purchased in 2011, Americans bought an additional 3.25 million imported from other countries, according to records from the U.S. Bureau of Alcohol, Tobacco, Firearms, and Explosives. Half of the 10 top-selling video games in the United States are described as “first-person shooter” games, where a gamer primarily guns down opponents. In the interest of authenticity (or product placement) some first shooter video games featured a detailed list of actual firearms that could be purchased in the real world. These lists were removed following the Newtown massacre in 2012. In 2013, the video game industry grew to $18.8 billion–a 40 percent increase from the year before. The biggest ever opening blockbuster in the spring of 2013 wasn’t a movie, but a game. Grand Theft Auto VI recorded sales of $310 million on its first day. Gunshots are the second leading cause of death among children ages 1 to 19, and the number one cause among black children. In 2010, over 13,000 died in terrorist attacks worldwide, while over 31,000 people were killed with firearms in America alone. Violence on stage has been around for a very long time, but we should consider whether it is helping or hurting us. A child in the Rivera Hernandez community, Honduras, is 85 times more likely to be murdered than a child in Australia.